The first two rounds of the 4NCL season took place this weekend. 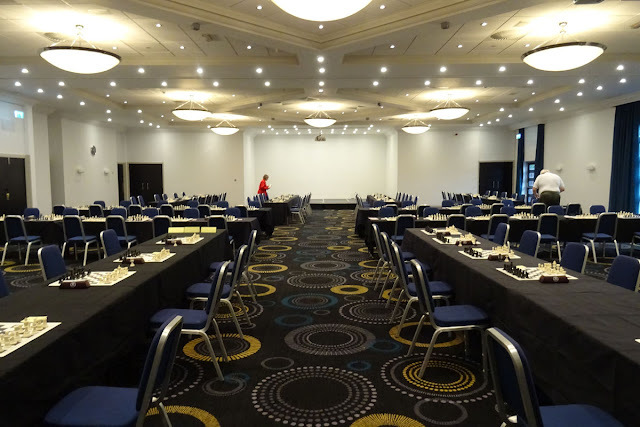 Divisions 1 & 2 were held at the Holiday Inn, Birmingham Airport. Playing on Board 1 for Division 1 team Oxford 1, IM Justin Tan faced two strong GMs and lost both games. In Division 2, Anglian Avengers 1 drew 4-4 on Saturday, and won 4½-3½ today. Individually, Andrew Lewis scored 1½, Adam Taylor 1 (two draws), Ed Player 1 and David Spence ½. In Division 3 (South), Anglian Avengers 2 drew 3-3 on Saturday, and won 3½-2½ on Sunday. Graham Moore scored 1, Steve Gregory ½, and Ian Wallis ½ (played only one game). In Division 4, Iceni 1 lost narrowly on Saturday 2½-3½, but whitewashed the Barnet Knights 3 youngsters 6-0 today. Jon Collins scored 1½ and John Feavyour 1. Iceni 2 played a triangular match, so the results were not known until today. They beat BCM Hippos 3½-2½, but lost to Oxford 3 by the score of 2-4. Peter Collicott scored 1½, Bob Jones 1 (two draws) and Vivian Woodward 0 .